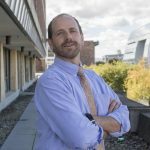 Our World in Data’s article Yields vs. Land Use: How the Green Revolution enabled us to feed a growing population includes an excellent set of data. 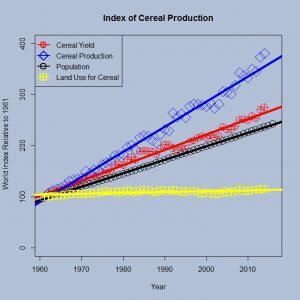 For example, thier data was used to produce the graph here, which includes the index relative to 1961 for land used for cereal (yellow), population (black), cereal yield (red), and cereal production (blue). Notice that as population has increased the land use for cereal production has remained flat, while cereal production has increased. Along with world data there is also regional data. Almost all of the data is useful for linear regression and the article itself has interactive graphs for a QL course. Note also that there is world grain data in the statistics projects section of this blog.